Welcome to the second post in the 2-part series on Easter Resources. 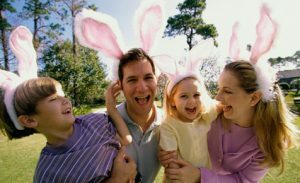 In Part 1, we covered how to utilize KidCheck features to get the most out of your Easter efforts and free you up to focus on the things that matter – connecting with new families. Easter is the ideal time to welcome families who’ve never attended. This week we’re covering the importance of first impressions, the greeting process, and capturing the right information so you can proactively follow up after Easter. Click here for Easter safety tips. You’ll Have Them at Hello! Making families feel welcome is a vital part of creating a connection and fostering interest in your children’s program. When new guests arrive, it’s essential to make them feel confident that their children are in safe hands. Every man, woman, and child appreciates a greeting with a warm smile and an authentic hello; this alone will put their minds at ease and confirms they’re in a friendly space. If your organization uses an electronic check-in system, the greeting team should help families get signed in or their account setup. The key is to capture enough information to follow up, yet not make them feel overwhelmed. Our suggestion, collect basic, relevant information that can be quickly provided. Consider name, phone, email, the child’s name, and birthday. When using KidCheck, the email address is important as it triggers a direct email to the visitor from KidCheck to remind them to create a login account (name and password) and input the rest of their account information from the comfort of their own home. After this, they will be all set for check-in next time they return to your organization. If there’s a concern with delays in check-in lines due to visitors taking longer to input their information, we recommend setting up a separate, operated check-in area specifically for visitors, so they won’t feel rushed or that they are holding up others. Plus, it provides a great opportunity to meet other visitors. The Check-in Assistant tool can help with this as well. While checking them in, share the organization’s commitment to safety and how the check-in/out process works. If you have special features such as integrated text messaging inform them that this is the way they will share critical information in case of an emergency. Finally, have your greeting team walk new families to their respective rooms and personally introduce them to the teacher. If possible, put a colored sticker or mark on the child’s badge to indicate it’s their first time. If a child is open to meeting other children, offer to introduce them to kids in their classroom. For older children consider assigning them a buddy for the day. Once the Easter festivities have passed, give new visitors a reason to return. Follow up with a hand-written note, thanking them for attending. Invite families to a short information session to share details about your children’s program or meet with them to answer any questions. Easter is also a good time to announce an upcoming children’s program such as VBS or a mom’s group that’s starting up – you get the idea! First impressions are lasting and difficult to overcome if they’re not positive. People make both conscious and unconscious judgments about competence, professionalism, and safety on what they first see. Never overlook the importance of offering a few common courtesies, ongoing support, and the invitation to connect. Click here to schedule a free online demo and learn more about KidCheck’s feature rich, secure children’s check-in system. For additional child safety information subscribe to the KidCheck blog, or join us on Twitter, Facebook, Pinterest, or Instagram.